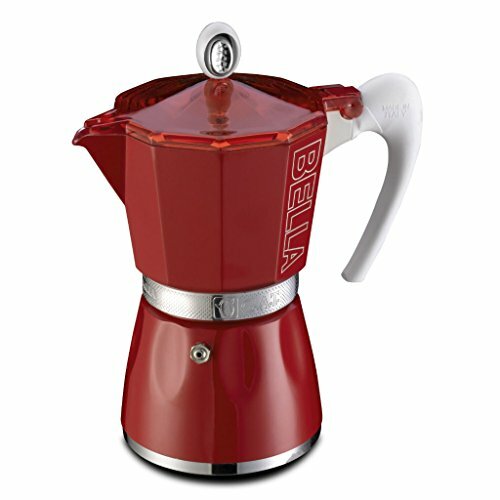 GAT Bella - Stove Top Espresso Coffee Maker - Ergonomic Handle - Certified Food Safe Aluminium - Red - 3 Cups by GAT at Rat Coffee Shop. MPN: 2790000083. Hurry! Limited time offer. Offer valid only while supplies last. The 3 cup GAT Bella espresso coffee maker is beautiful, trendy, colourful and traditional. With it, you can now make authentic espresso at home. It is made in Italy from certified food safe aluminium with a red gloss finish and white handle and knob. The coffee maker is suitable for all hobs except induction. It has an overall height of 16.5cm/6.5in with a base of 9in/3.5in.